Make connections for young children with special needs in your classroom with research-based products for inclusion and progress monitoring. 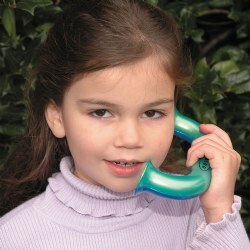 Our goal is to bring you a great selection of products that are all appropriate for early intervention. 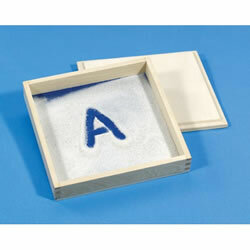 Practice letter writing with this solid 8" x 8" wooden box. The contrasting dark blue laminate bottom makes letters stand out clearly. Includes lid and fine grain sand. 3 years & up. Economical set of kids' favorite animals and shapes. Practice coordination while threading tipped laces. No needles needed. Set includes 16 laces and 16 shapes (approximately 6 inches). Made of heavy duty chipboard. 3 - 6 years. Practice coordination while threading tipped laces- no needles needed- in and out of the holes that edge these wipe- clean charmers. 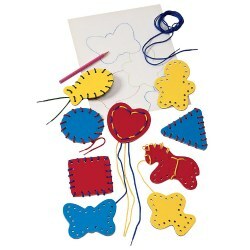 Includes 9 tipped 36" laces and 9 colorful shapes (4"- 5" L) made from heavy-duty chipboard. Professional grade medium texture therapy putty for hand and finger rehab and exercise, and for stress reduction. Odorless, non-flammable and will not stick to hands. 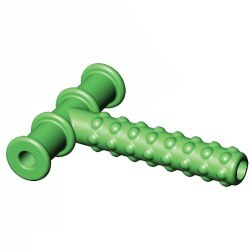 With endless ways to be molded or shaped, offers a wider range of possibilities versus squeeze balls. Coral-colored putty comes in an air tight, resealable plastic container. 4 ounces. 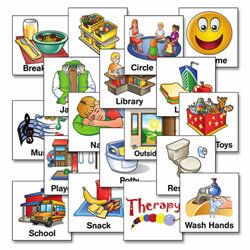 This schKIDules™ Magnet Set includes 20 magnets featuring children's daily tasks. 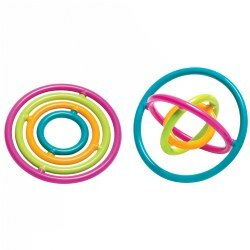 Magnets included are: Breakfast, Centers, Circle Time, Free Play, Jacket, Library, Lunch, Music, Nap, Outside Play, Pick Up Toys, Playground, Potty, Restroom, School, Snack, Therapy, Wash Hands, and 2 blank magnets. Use with schKIDules™ Magnet Board (item 28893). 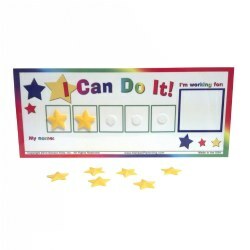 This lightweight, laminated Token Board is ideal for helping students stay on task and for rewarding good behavior. Once the student receives 1 to 5 stars, they receive a reward: a favorite activity, a toy or something good to eat. There is a 2" box at the end of the row so that the instructor can place an image of the reward. The token board comes with 8 reusable reward stars. Measures 5" X 9". 3 years & up. Buttons made from natural hardwood branches, sanded smooth for safety. Includes 32 buttons and 4 colorful laces. Great for lacing, counting and sorting. 4 years & up. Express your creativity using every color of the rainbow! 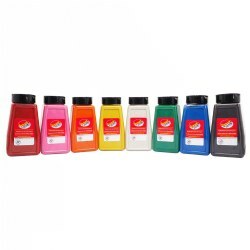 This Rainbow Sand Art Set features a beautiful assortment of 8 vibrant, essential sand colors in 28oz bottles. The bottles are refillable with shake or pour lids. 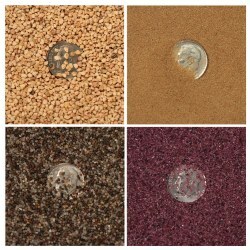 Perfect for sand art, crafts, and artistic keepsakes. Colors include: Red, Pink, Orange, Yellow, White, Green, Blue, and Black. 3 years & up. This inflatable wedge seat encourages static anatomical seating while mimicking the dynamic seating motion of a therapy ball. 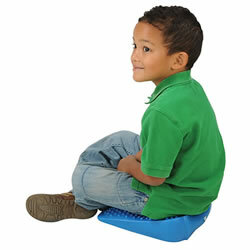 It is great for kids with poor posture and those who have trouble sitting still. In particular, kids with ADHD and/or Sensory Integration Dysfunction will benefit from the Movin' Sit Jr. 10"W x 10"L.
PreK & up. 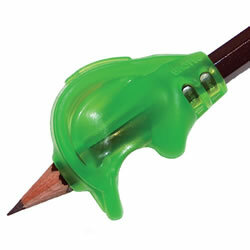 This ergonomic pencil grip was designed and tested by an occupational therapist. Finger guards hold figures in a mature tripod grasp and activate proper muscles to strengthen hand while writing. Results in increased endurance and precision. Latex free. 2 years & up. 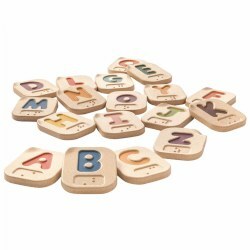 This 26 piece Braille alphabet set features double sided pieces. One side upper case, another one lower case. Each has Braille symbol that represents each letter in the alphabet. Made from sustainable rubber wood. 4 years & up. Express your creativity using every color of the rainbow! 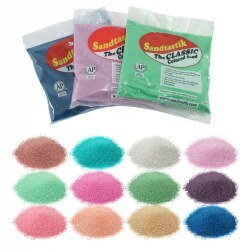 This Classic Color Sand Assortment features 12 colors of 1 pound bags of Classic Colored Sand.. Perfect for sand art, texturizing art, model scenery, and more. Bonds well with glue and adhesive paper. Colors include: Black, Yellow, Brown, Orange, Pink, Emerald Green, Blue, Red, Peach, White Mauve, and Light Blue. 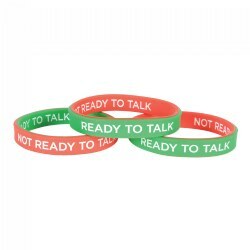 Use this pack of self-assessment bands to help children communicate their understanding of a topic or feelings directly, visually, and confidentially to the teacher. Made out of dual layered silicone, with debossed lettering on both sides. Measures 7" x 1/2". 3 years & up. Children will master basic dressing and self-help skills with the Hook & Loop Dressing Vest! 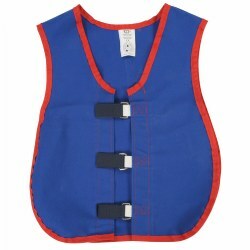 This heavy duty, washable vest encourages children to practice buttoning and fastening over and over again until they succeed. Each attempt promotes independence as children learn to dress themselves. Ideal for home and classroom learning. 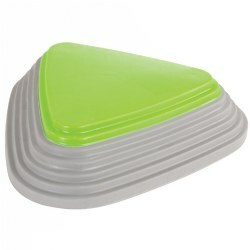 The elastic side panels allow one size to fit most children. 2 years & up. 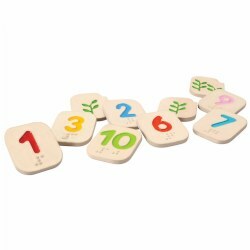 This ten piece tile set makes learning numbers in Braille as easy as 1-2-3. Each tile features one side with the numeral and corresponding Braille cells and the other side features impressed leaf illustrations to help children count. Children can trace the indentations on each tile and learn to count with their fingers while counting out loud. Grades PreK & Up. Students learn through touch and the Sensory Literacy Kit gives you great resources for tactile literacy activities. 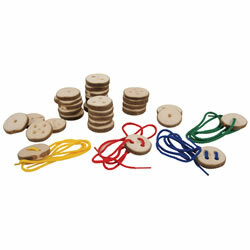 The kit includes Phonic Pebbles which includes 64 pebbles with 44 phonemes carved into unique and durable stones. 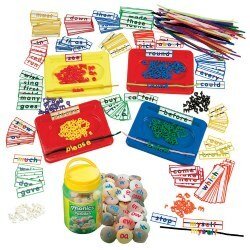 Also included is a set of Sight Word String Ups which combines fine motor development and sight word recognition with over 200 sight words! 3 years & up. This set of beautiful habutae fabric features a shiny aesthetic in seven different colors of the rainbow to create fascinating visual effects. Use them for dramatic play scenarios, enhance music and movement, or textural and visual simulation. Fabric measures 39.4" x 57". 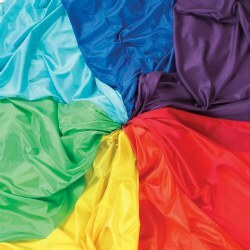 Included: 7 Pieces of Habutae Fabric in Red, Orange, Yellow, Green, Blue, Indigo, and Violet. 3 years & up. This set of beautiful sequins fabric features a shimmering metallic aesthetic in four different colors to create fascinating visual effects. Use them for dramatic play scenarios, enhance music and movement, or textural and visual simulation. Fabric measures 39.4" x 38.6". 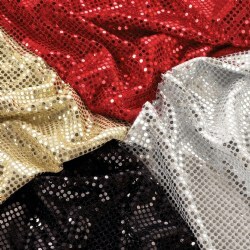 Included: 4 Pieces of Sequin Fabric in Gold, Red, Silver, and Black. 3 years & up. This set of beautiful organza fabric features an added touch of sparkle in seven different colors of the rainbow to create fascinating visual effects. 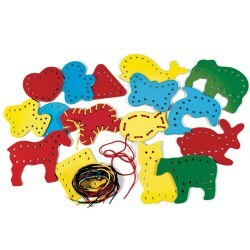 Use them for dramatic play scenarios, enhance music and movement, or textural and visual simulation. Fabric measures 39.4" x 59.1". 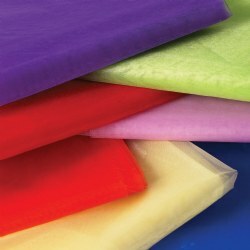 Included: 7 Pieces of Organza Fabric in Red, Orange, Yellow, Green, Blue, Indigo, and Violet. 3 years & up. Each sand has a unique quality that children will find fascinating. the river bed and garnet sands have clean grains with a crunchy texture, while objects sink in quick sand when water is added. The knot sand has a rough texture but is extremely lightweight.